America’s Port, more commonly known as the Port of Los Angeles, occupies 7,500 acres of land and water with over forty miles of waterfront. 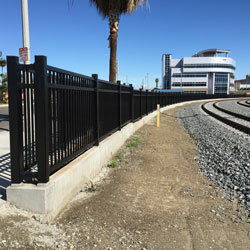 Econo Fence, Inc. selected STRONGRAIL® fiberglass architectural handrail system for a leading container terminal operator and stevedore customer located in the Port of Los Angeles, California. 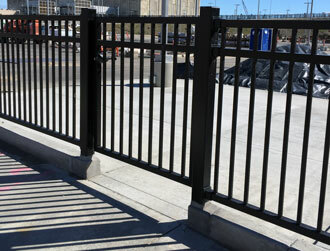 Over 1,700 linear feet of handrail were used to serve as a safety perimeter fence to separate pedestrians from electrified rail tracks. STRONGRAIL® primarily chosen because of the fiberglass handrail’s low electrical conductivity and high strength. Upon looking at options, Econo Fence also took into consideration the customer’s proximity to the coastline. While STRONGRAIL® fence offers an aesthetically pleasing solution which prevents pedestrians from gaining direct access to the electrified rails, it also will provide years of maintenance-free service due to its noncorrosive properties. The STRONGRAIL® style selected was black 2” square rails with 1” square pickets. The fence sections connected using STRONGRAIL® square tube posts and caps. Installation of the lightweight fiberglass handrail went smoothly, a very important consideration when working between live track lines where freight trains carry over $1 billion worth of cargo daily. The project encompassed over 200 (8’ long section) panels and 206 posts with internal base plate assemblies. Econo Fence was able to install the fence in its entirety within three days, as the base plates were installed first, followed by post and fence sections. The installers noted that although the up-front costs were higher than steel fencing, the costs associated with having two certified welders/iron workers and painters to weld, grind, modify, and paint the fencing more than made up for the material cost difference. The end user and installers were both complementary of the results and commented that the installation looked and felt complete with zero concerns of strength or durability.